The word ‘Coprolite’ has been derived from the Greek words Kopros Lithos that means ‘dung stone’. 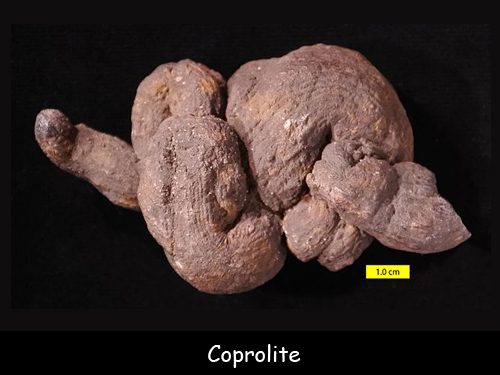 Coprolites can be defined as very old pieces of poop that have been fossilized over time. They come in various shapes and size and have been discovered on every continent on earth. These fossilized feces do not smell as the organic matter in their original structure has been replaced by mineral deposits like calcium carbonates and silicates. Coprolites are also known as fossilized excrements or trace fossils. The process of mineralization makes the feces hard and odourless and they become indistinguishable from a rock to the untrained eye. The person who studies trace fossils is known as Paleoscatologists and the field of studying them is known as ‘ichnology’. The largest coprolite ever found was 17 inches long and approximately 7 inches wide. Coprolite can give scientists a lot of information about the feeding behaviour of that particular animal and how it lived. Coprolites are very rare because animal feces decay very rapidly. Only a close examination can help to determine whether a specimen is a coprolite or just a stone. An English theologian William Buckland was the first person to coin the term ‘coprolite’ in 1829. On a geologic scale, animal feces do not take long to get fossilized. Sometime, the entire process is over in just a few hundred years.